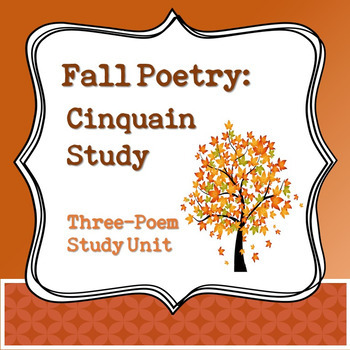 The cinquain is a fun and very manageable form of poetry for students to write. 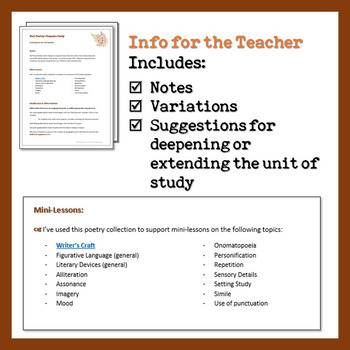 Use this unit for some seasonal poetry study! Teach your students about three common forms of cinquain, and let them find out which is their favorite. Teach your students about three common forms of cinquain, and let them find out which is their favorite! Poster project and rubric included. 30 + pages of activities and materials. 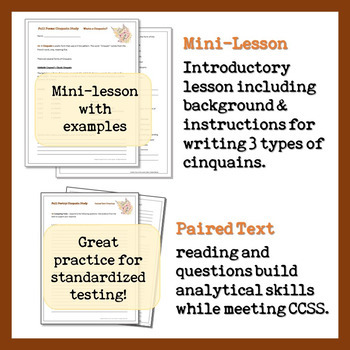 * Write a Cinquain Activity - 3 options & templates! Often aligned to the Common Core. Questions crafted with attention to Bloom's Taxonomy. This set of three cinquains is perfect for teaching Author's or Writer's Craft. 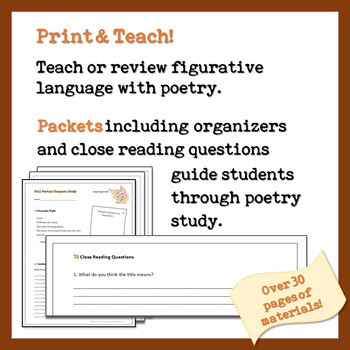 Extend or deepen your unit or focus on the study of language with my Author’s or Writer’s Craft Introductory Unit, which includes a mini-lesson, Do-Now’s, Information for the Teacher, Craft Practice, a Craft Study assignment that can be used again and again with ANY text to study the art and craft of writing, and much more. Learning how to help students look at writer’s craft changed the way I teach and the way my students learn. Use a craft study (available in my unit) as the unit assessment. Fall Poetry: Cinquain Study created by Lauren Colletti is licensed under a Creative Commons Attribution-NonCommercial-NoDerivs 3.0 Unported License.